On April 1, 1929, four companies, Oliver Chilled Plow Company (1855), Hart-Parr Tractor Comany (1897), Nichols-Shepard Threshing Company (1848) and American Seed Company (1848) merged to become the Oliver Farm Equipment Company. In later years the company became the Oliver Corporation with offices in Chicgo, Illions. The White Motor Corporation aquired Oliver as a wholly owned subsidiary in 1960. In February 1962, White Motor Corporation also purchased Cockshutt Farm Equipment of Canada (1839), located in Brantford Ontario. Cockshutt became a subsidary of White's Oliver Corporation. The 130 year old Cockshutt Company built an outstanding reputation for engineering and manufacturing harvesters and tillage equipment. During the 1930's Cockshutt outsourced its first tractor production to Oliver and during the 1950's the company offered its own tractor line. Cockshutt by the 1960's was best known for its combines and tractors. 1929 was also the same year which Minneapolis-Moline Power Implement Company came into exsistence as a result of the merger of the Moline Plow Company (1870), the Minneapolis Threshing Machine Company (1887) andMinneapolis Steel and Machinery Company (1902). In 1949 its name was shortend to Minneapolis-Moline. The Avery Plow and Tractor Company (1825) became part of Minneapolis-Moline in 1951. Minneapolis-Moline became a wholly owned subsidary of the White Motor Corporation. 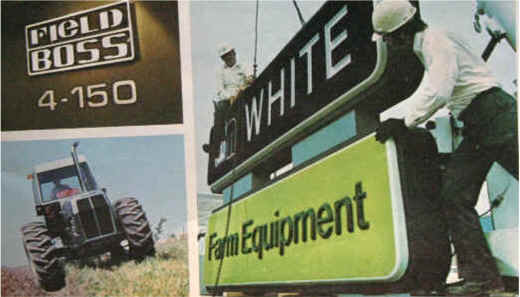 In 1969, Oliver, Minneaplois-Moline and Cockshutt formed White Farm Equipment with headquarters in Oak Brook, Illionois. The parent company White Motor Corporation's headquarters remained in Clevland, Ohio. 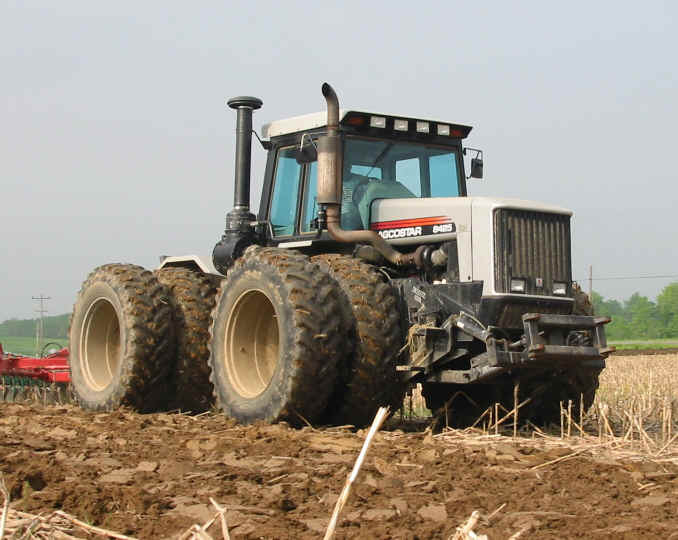 The first White brand articulated 4wd tractors debuted in 1969. The new 139 horsepower tractors were offered as the Oliver 2455, Minneapolis-Moline A4T-1400 and WHITE Plainsman A4T-1600. WHITE tractors in 1969 began displace the Cockshutt name in Canada and the Plainsman was only sold north of the U.S. border. The White 4 series four wheel drives 1800 rpmengine offered a naturally aspirated 139 hp and with a turbocharger 151 hp. 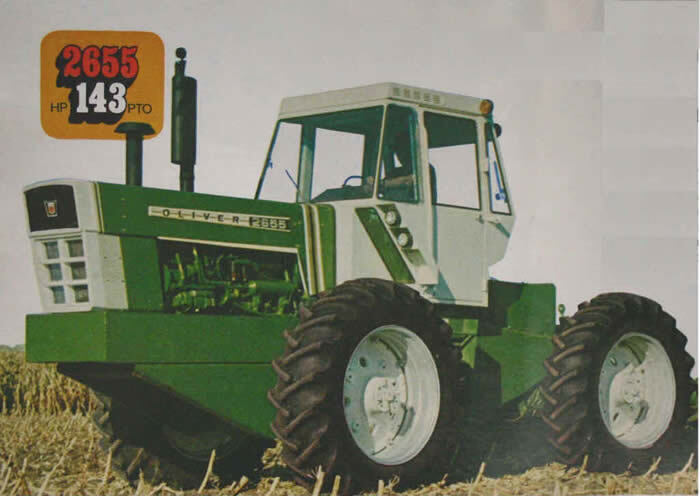 In 1970 White introduced the 6 series Oliver 2655, Miineapolis-Moline A4T-1600 and WHITE Plainsman A4T-1600. These big 4wds offered a 585 cu. in 2200 rpm engine rated at 169 hp. In 1974 White consolidated Oliver, Minneapolis-Moline and Plainsman into a newly designed 150 hp White 4wd. 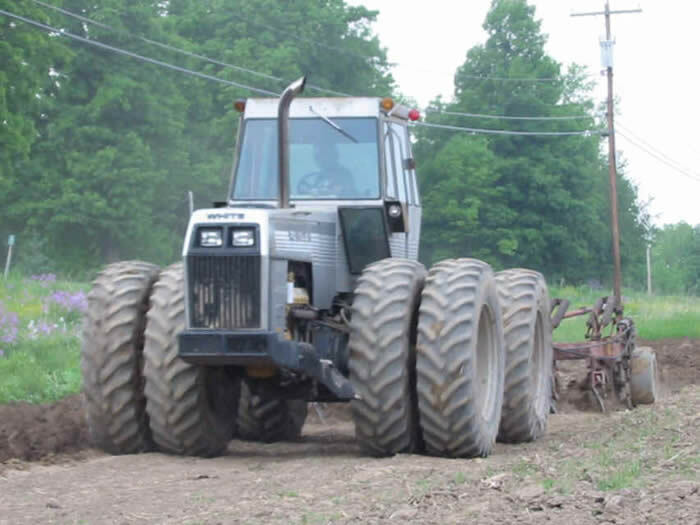 White released a newly designed tractor meeting farmers demand for better tractor. "Like nothing you've ever seen before! That is how White advertising introduced the new White 4-150 Field Boss. The 4wd was powered by a Catepillar V-8 engine and offered imporved oscillation at the center of the tractor and articulated sterring allowed for a shorter turning radius. The White "Boss" line styling and silver charcoal gray color replaced the Colover Green, Prairie Gold and White Sumac Red. 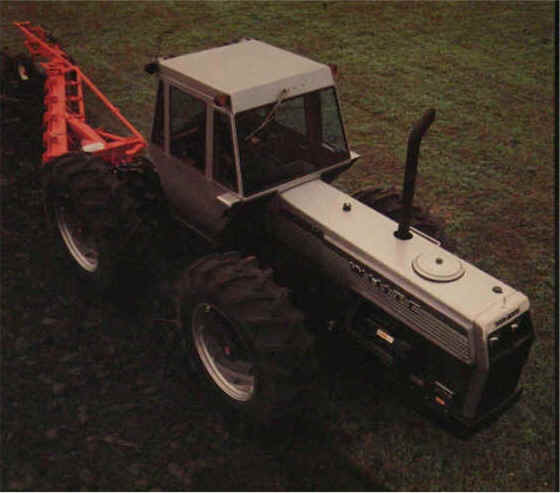 The 4-150 was the first tractor with the White “Boss Line Styling and the first to be marketed as a White.” White’s new identity included sleek form fitting sheet metal and an all new silvery charcoal gray paint scheme. The 4-150 was powered by a Caterpillar V8 engine oscillation at the center of the unit with articulated power steering. The 4-150 blazed a trail for White’s grand unveiling “Of the Boss Line in 1975.” Oliver’s clover green Moline’s prairie gold and Cockshutt’s big red were retired to the history books in favor of silver. The 150 HP 4-150 was joined in 1975 by the 180 HP 4-180 Field Boss. This new powerful 4 WD offered options such as an air conditioner, heater, and a protective roll over cab. 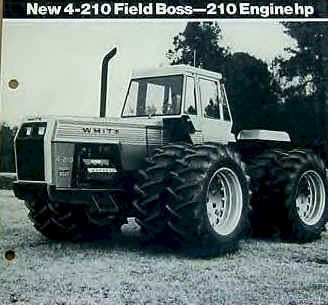 In 1978, the big 4-210 joined the Boss Line. The cab included the latest improvements such as a reduced sound level of 81.0 decibels. The dash provided a 14 channel monitoring display in an 8 channel digital display of speeds and temperatures. Night visibility was improved by adding two headlights at the top of the grill. The 4-210 offered a maximum HP of 210. In 1979, the original 4-150 was updated and became the 4-175. Again the new model number reflected the HP of the engine. The 4-175 was updated with many of the same features as the 4-210. As the Boss Line offered new power and products, the company went into a corporate crisis. In May 1976, Consolidated Industries and the White Motor Corporation were planning to merge, but plans collapsed the day before stock holders were to vote on the merger. This situation left the future of White Motor in doubt because the company had lost 69 million dollars in 1975 and its share of the truck market was declining. Speculation quickly grew that White Motors would sell it’s White Farm Equipment division to ease its troubles. In 1977, Consolidated Freightways Inc. took over distribution of its freightliner trucks and thus White Motor lost 40 % of its truck sales. By September 1980, the White Motor Corporation simply ran out of money and was forced to file for Chapter 11 of the Federal Bankruptcy code. That November, White announced it would sell the farm equipment line to the TIC Investment Corporation of Dallas, Texas. TIC resumed farm equipment production in 1981 as WFE (White Farm Equipment). In 1982, WFE told its dealers that two new 4WD models were on the way. The new tractors included the 225 HP 4-225 and the 270 HP. The 4-225 replaced the 4-175 and 4-210 but its styling and configuration were very similar. Its wheel tread was adjustable and this 4 WD could be used for row crop work. The 4-270 featured a new larger articulated frame that included a wider hood and grill and its larger tires gave it a massive appearance. Both tractors continued to feature V8 Caterpillar engines. The 4-225 continued to use the same transmission that was used on past Field Boss and Oliver/Minneapolis Moline 4WD’s. The big 4-270 featured a 4x4 power transmission which was 10 years in development. The cabs were updated with sound deadening insulation that reduced the inside noise level to 78 decibels. 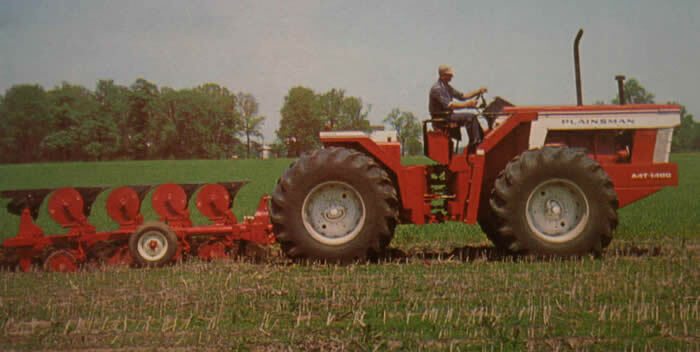 Unlike many competitive 4 WD tractors, an independent 1000 RPM PTO was standard equipment for both models. The WFE 4 WD’s were produced from late 1982-1988. Once again the White Farm Equipment Line fell on hard times and TIC sold the division to Allied Products. Allied owned the New Idea Equipment line and soon formed White-New Idea. The new company decided to end production of the 4 WD tractor line because they are special row crop niche could not compete against the high horse power 300- 400 Steiger, Versatile and John Deere 4 wheel drive tractors. The White 4wd ceased production but silver would rise again to lead the horse power race. AGCO was formed in 1990 by former Allis-Chalmers executives. The executives took over Deutz-Allis and then purchased the White and Hesston brands. In 1993 AGCO acquired the rights to Massey-Ferguson. 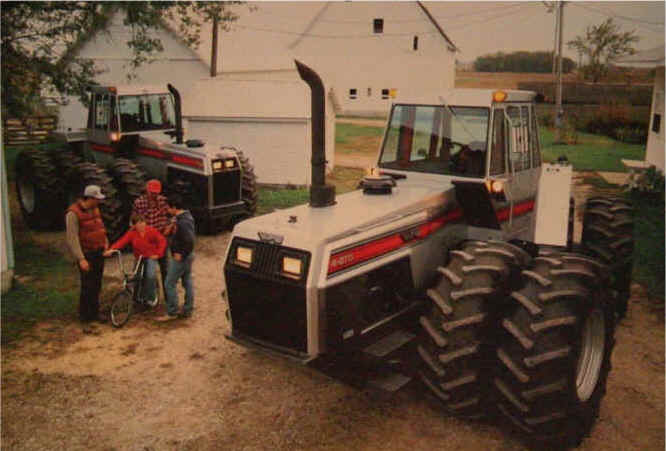 By 1995 AGCO was in need of a 4wd to fill out its wide tractor line. 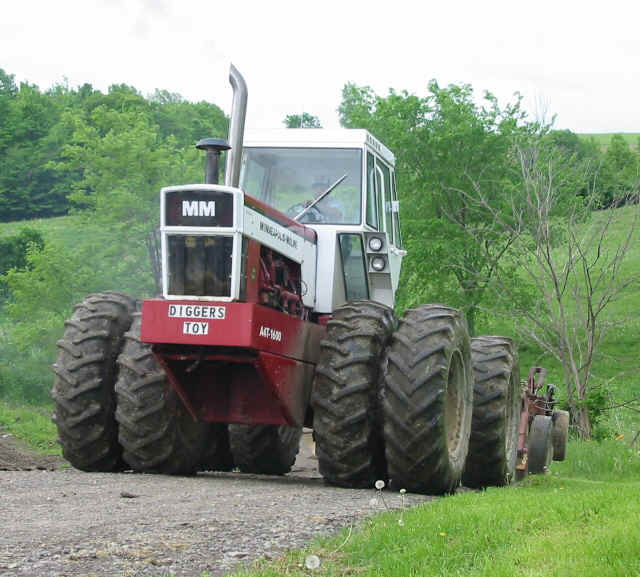 The McConnell-Marc was a good fit and the former Massey-Ferguson tractor design was moved to the AGCO/White Cold Water, Ohio tractor plant for production. 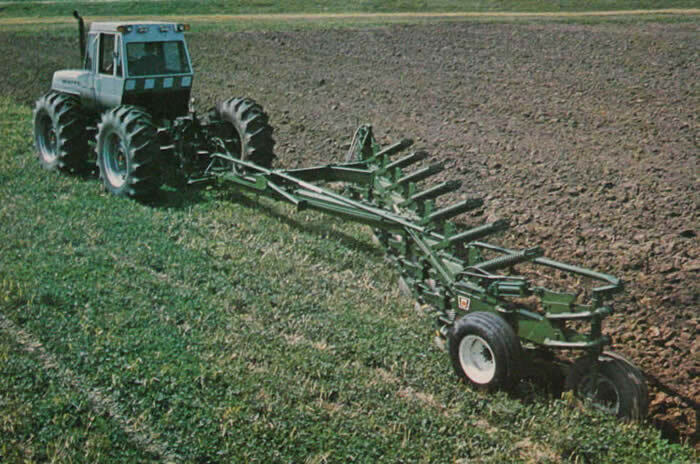 The MF design was tweaked in 1994 with new options and sheet metal to develope the AGCO-Star was released. AGCO-Stars 4wds offered both Detroit-Diesel and Cummins engine options. Beginning in 1995, AGCO sold the 425 hp 8425 and 360 8360 AGCO-Star through AGCO-White and AGCO-Allis dealers. The flag ship of the AGCO line, highlited the company's combined hertitage. The big 4wds were painted White Silver and decaled with an Allis orange to keep both customer bases happy. In 2001 the AGCO-Star brand was retired when AGCO aquired Caterpillars tracked Challenger line. In 2006 AGCO will return to the articulated market with an all new wheeled Challenger 4wd. Could an orange painted, silver decaled AGCO brand 4wd be far behind? To learn more about the models offered in White's 25 years in the 4wd business read the model history and specifications, in the article segments below. 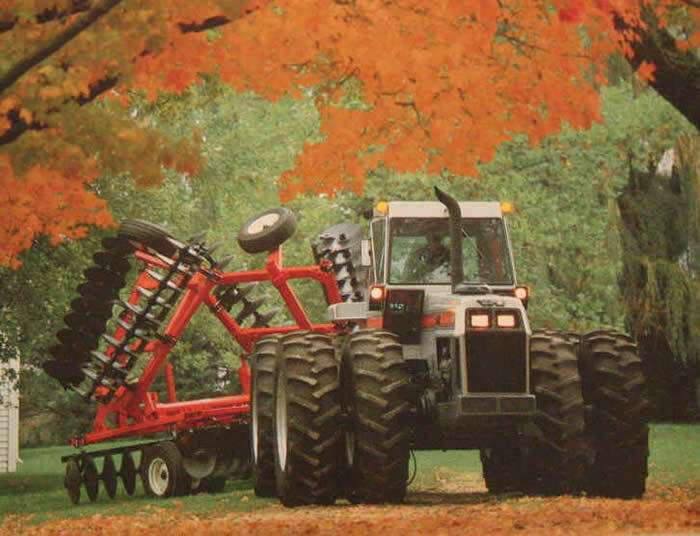 AGCO introduced the AGCO-Star to AGCO-White and AGCO-Allis dealers in the fall of 1995. AGCO had the first 425hp standard 4wd on the market in the mid-1990's. During this time John Deere New Holland and CaseIH's top range 4wds only reached 400hp. The AGCO-Star shared hertiage from AGCO's three main tractor lines. 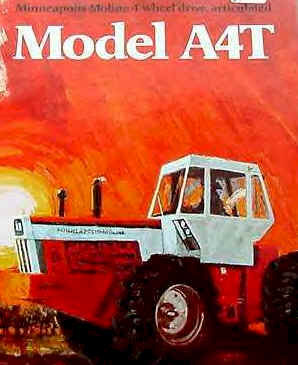 In 1994 AGCO purchased the McConnell-Marc 4wd line which had been the Massey-Ferguson 4wd line until 1991. AGCO used the MF 5200/McConnell 1000/900 4wd design to create the 8425 and 8630. The AGCO-Star was paited in White silver and its decals bore Allis orange, Massey Ferguson Red and White Silver pin stripes. The 425 hp 8425 and the 360hp 8630 were produced at the AGCO-White plant in Coldwater, Ohio plant. They offered a ROPS cab with isolated mounting and an insulated interior to reduce sound level. Other features for comfort included blue tinted cab windows, a tilt telescoping steering wheel, deluxe air ride seat and right hand console. The hood sloped down and the muffler was located near the right front corner of the cab to improve forward visiabilty. AGCO ceased production of the AGCO-Star in 2001 as AGCO-White silver and AGCO-Allis orange tractors were merged into an orange AGCO tractor with silver decals. At the same time AGCO purchased Caterpillar's tracked tractor Challenger line. The new range of 340-500hp MT800 series tracked Challengers replaced the AGCO-Star 4wds in the AGCO line. In 2006 AGCO will return to the articulated market with an all new wheeled challenger. 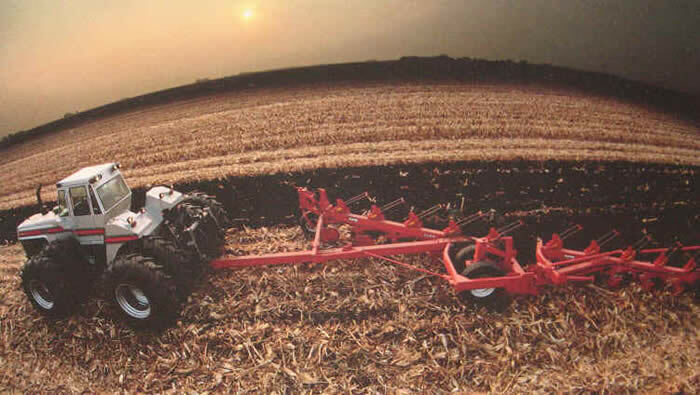 The 8425 and 8360 AGCO-Star 4wds would have competed against the CaseIH Steiger 9390 and 9380 , John Deere's 9400 and 9300 , and New Holland's 9682 and 9882. The 4-270 was a big step up from the 4-225. Because the 4-270 offered more power it was the first new White 4wd design since the 4-150 introduction in 1974. White put a turbo-charged and sftercooled Caterpillar 6 cylinder engine in the 4-270. The addtional power required a new 4x4 power-shift transmission. Speeds ranged from 1.9 to 20.7 mph. A catagory 3 three point hitch was available. The 4-270 White 4wds would have competed against the Allis-Chalmers 4W-305,rigid frame Case 4890, International Harvester 4786, 6788 and 7488 2+2, John Deere's 8650 & 8850, Steiger's Cougar, Series IV and 1000 4wds, Versatile's articulated Designation 6 946 and Massey Fergusons 4880 and 4900. Specifications: 270 hp, 10.5 L Caterpillar in-line 3306 six- cylinder engine, 2,600 rpm pto, 4x4 Power-Shift transmission. The 4-225 was a turbocharged upgrade of the 4-210. It offered an over/under 18 speed transmission, inboard planetary final drives, power wet-disk brakes and a draft sensitive 3pt hitch. The 4-225 White 4wd would have competed against the Allis-Chalmers 4W-220, Case 4690, International Harvester 4386 and 6788 and 7288 2+2, John Deere's 8450 & 8650, Steiger's Wildcat and Bearcat, Series III 4wds, Versatile's Designation 6 846 and 876 and Massey Fergusons 4840 and 4880. Specifications: 225 hp, 10.4 L Caterpillar V-8 engine, 2,600 rpm pto, 3x6 Power-Shift transmission. In 1979, the original 4-150 was updated and became the 4-175. Again the new model number reflected the HP of the engine. The 4-175 was updated with many of the same features as the 4-210. The new tractor offered headlights on the grille and digatal monitering stations in the cab. The 4-175 White 4wd would have competed against the Allis-Chalmers 7580, Case 4490, International Harvester 3588 and 3788 2+2's, John Deere's 8440 & 8640, Steiger's Wildcat and Bearcat, Series III 4wds, Versatile's 555 and 750 and Massey Fergusons 4840 and 4880. Specifications: 175 hp, 636 cu inch 3208 Caterpillar V-8 engine, 2,600 rpm pto, 3x6 Power-Shift transmission. In 1978, the big 4-210 joined the Boss Line. The cab included the latest improvements such as a reduced sound level of 81.0 decibels. The dash provided a 14 channel monitoring display in an 8 channel digital display of speeds and temperatures. Night visibility was improved by adding two headlights at the top of the grille. The 4-210 offered a maximum HP of 210. 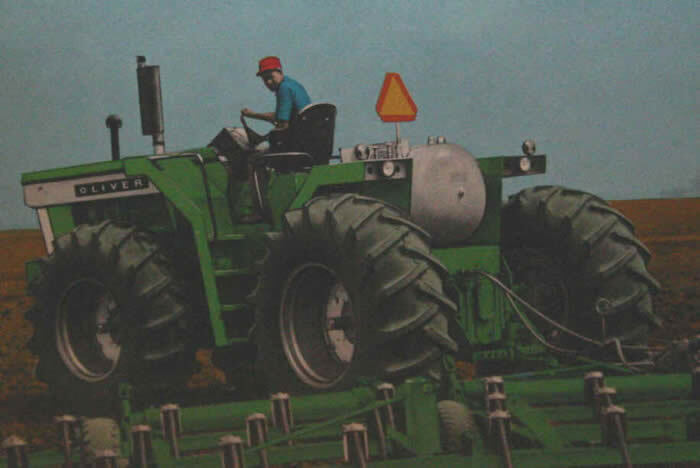 The 4-210 series White 4wds would have competed against the articulated Allis-Chalmers 7580, rigid frame Case 2470 and 2670, International Harvester 4186, 4386 and 4586, John Deere's 8440 & 8640, Steiger's Wildcat and Bearcat, Series III 4wds, Versatile's 555 and 750 and Massey Fergusons 4840 and 4880. Specifications: 210 hp, 636 cu inch 3208 Caterpillar V-8 engine, 2,800 rpm pto, 3x6 Power-Shift transmission. 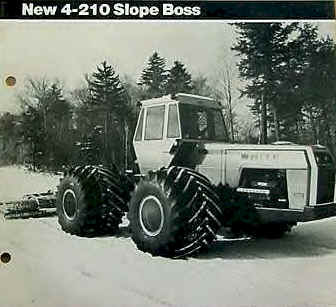 Notes: The 4-210 was sold to ski resorts as the "Slop Boss" 4wd. It was sold with large floatation tires that were mounted backwards. The turned around tires allowed for better traction and alowed the 4wd to climp steep snow covered ski slopes. The 4-210 "Slope Boss" was used to pull a drag to groom ski slopes and trails. The 150 HP 4-150 was joined in 1975 by the 180 HP 4-180 Field Boss. This new powerful 4 WD offered options such as an air conditioner, heater, and a protective roll over cab. It looked very much likes it 150 hp little brother but the 180 hp had more to offer the higher horse power. White 4-180 was equiped with outside planitaries on the axles to reduce the torque load on the final drives and transmission. 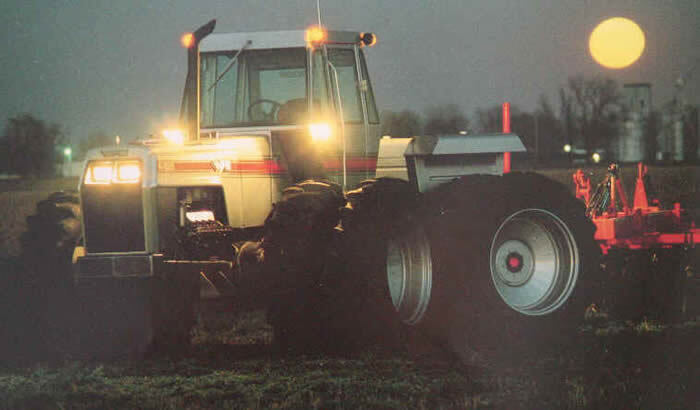 The 4-180 series White 4wds would have competed against the Allis-Chalmers 7580,rigid frame Case 2470 and 2670, International Harvester 4166, 4366 and 4568, John Deere's 8430 & 8630, Steiger's Wildcat, Bearcat, Series III 4wds, Versatile's 555 and 750 and Massey Fergusons 1550 and 1850. Specifications: 180 hp, 636 cu inch 3208 Caterpillar V-8 engine, 2,800 rpm pto, 12x2 Hydraul-Shift transmission. 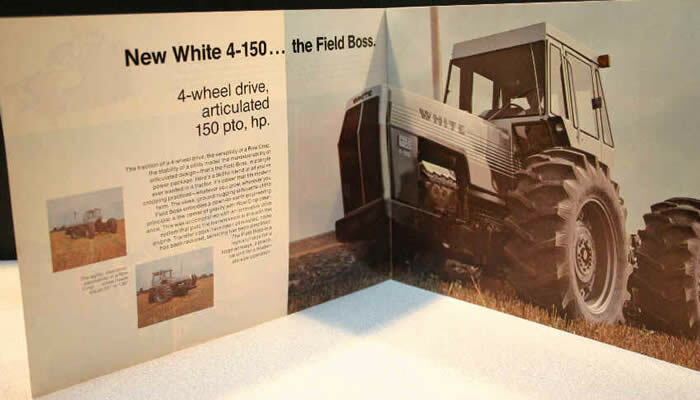 The 4-150 was the first tractor with the White “Boss Line Styling and the first to be marketed as a White.” White’s new identity included sleek form fitting sheet metal and an all new silvery charcoal gray paint scheme. The 4-150 was powered by a Caterpillar V8 engine oscillation at the center of the unit with articulated power steering. It was built to be a row crop tractor. It was designed by using two Oliver 2wd rear main housings that were placed front to front. 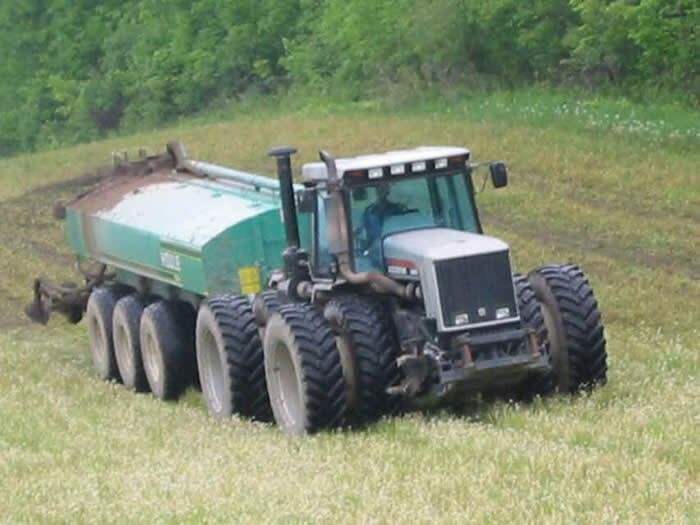 This configuration produced a narrow tractor with reduced overall height. The 4-150 blazed a trail for White’s grand unveiling “Of the Boss Line in 1975.” Oliver’s clover green Moline’s prairie gold and Cockshutt’s big red were retired to the history books in favor of silver. The 4-150 White 4wd would have competed against the Allis-Chalmers 7580, Case 2470 and 2670, International Harvester 4166 and 4366, John Deere's 8430 & 8630, Steiger's articulated Wildcat and Bearcat Series II 4wds, Versatile's 500 and 700 and Massey Fergusons 1550 and 1850. Specifications: 151 hp, 636 cu inch 3208 Caterpillar V-8 engine, 2,800 rpm pto, 12x2 Hydraul-Shift transmission. The White 6 series Minneapolis-Moline, Oliver 2655 and WHITE Plainsman A4T-1600 4wds were produced from 1971-1972 and sold through White dealers through 1973. The 6 series 4wds were built by Minneapolis-Moline but in 1972 when the MM factory was closed, responsibilty for the 4wds moved the Oliver plant in Charles City, Iowa. The 6 series 4wds used a 585 cu. inch Minnieapolis-Moline disel engine or a 504 cu. inch LP Minneapolis-Moline engine. The 6 series White 4wds would have competed against the Allis-Chalmers 440, Case 2470 and TK 1470, International Harvester 4166, John Deere's 7020 & 7520, Steiger's Wildcat and Bearcat 4wds, Versatile's 500 and 700 and Massey Fergusons 1550 and 1850. Notes: The Oliver 2655 was offered in both Clover Green as well as red, white and blue hertitage colors. In November 1969, at White's annual dealer meeting the compay's largest tractor to date was introduced. The 4 series White 4wd was developed at the Minneapolis-Moline tractor plant in Minnesota. It was the first tractor that shared a common platform across all three brands. 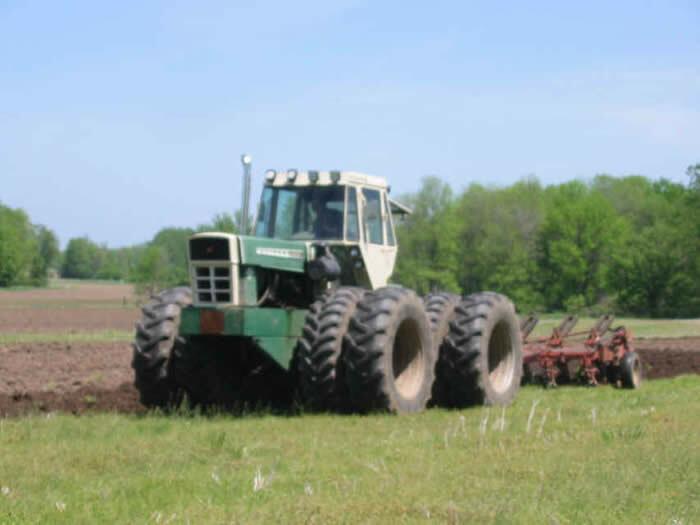 It was sold in the United States as a Minneapolis-Moline A4T-1400 and Oliver 2455. In Canada it was sold along side the Cockshutt line as the WHITE-Plainsman. These tractors were sold with the White name or with their tradtional brand logos on their grilles. 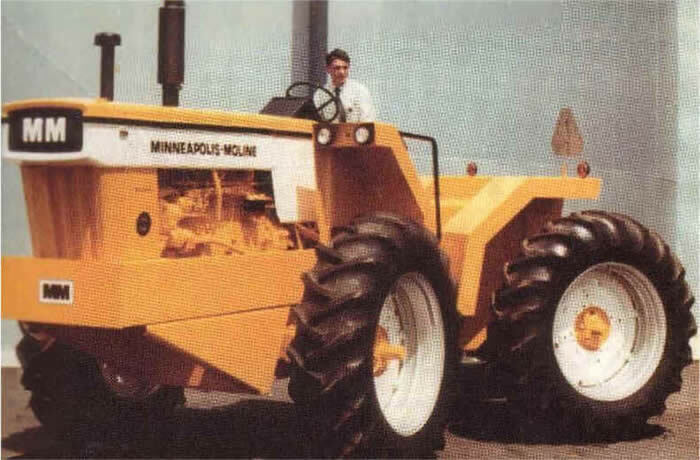 These 139 hp tractors were available with a disiel or LP Minneapolis-Moline engine. 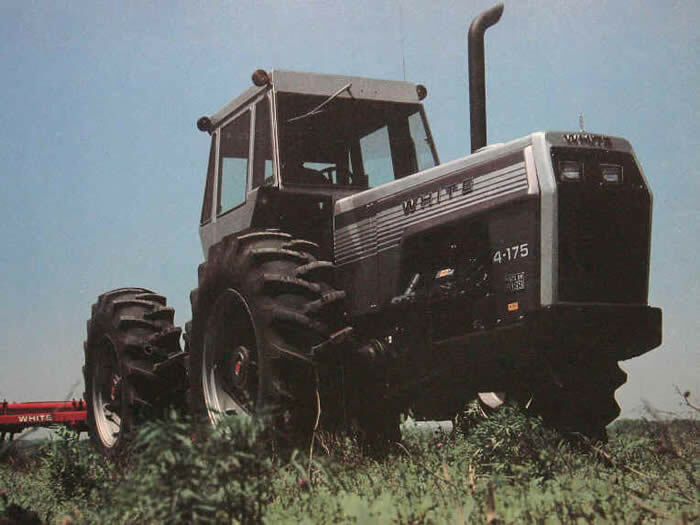 The 4 series White 4wds would have competed against the rigid frame Case TK 1470 and 2470, International Harvester rigid frame 4156 and 4166, John Deere's 7020, Massey Ferguson 1500, Steiger's articulated Wildcat, Super Wildcat, Bearcat Series I 4wds and Versatile's 145. Notes: The M-M A4T-1400 was sold in White red but a few dealers in Minnesota and one dealer in Oklahoma sold the 4wds in M-M gold. 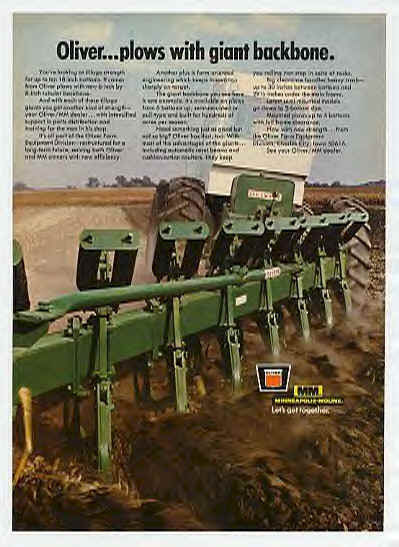 The inspiration for the Minneapoils-Moline/White 4wds came from Don Oliver's Stuttgart tractor. The Stuttgart tractors were built by Mr. Don Oliver a Minneapolis-Moline dealer in Stuttgart, Arkansas. Rice farmers in the area were looking for bmore traction. Mr. Oliver built several different versions of the "Stuttgart" tractor using Minneapolis-Moline U's and G's . 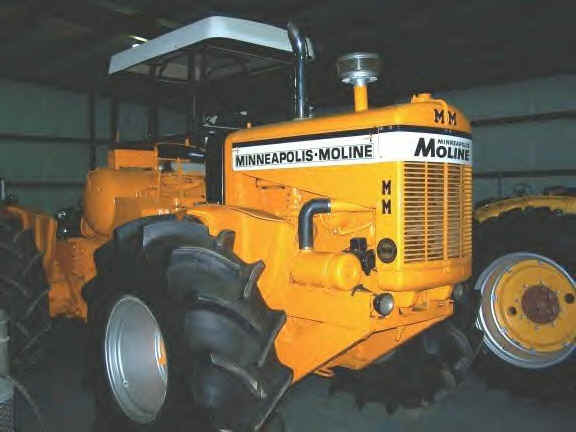 White used Don Oliver's custom Minneapolis-Moline 4wd design to help develope an in house Minneapolis-Moline and Oliver 4wd.